Successfully Added Big Screen LCD Projector for Home / Office / School to your Shopping Cart. Big Screen LCD Projector for Home / Office / School is a versatile big screen or wall LCD projector for every occasion! Why spend thousands on a big screen TV when this large screen projector approximates the feel of a plasma or LCD TV, but costs so much less? This AV projector is perfect for those with enormous viewing demands, but don't want to spend big! Imagine the excitement: hooking up a DVD player to this unit and watching Transformers on a 300 inch screen! This wonder projector will make your home theater dreams come true. Better yet, connect up your Microsoft XBOX 360, Sony PS3, or Nintendo Wii and spend hours and hours enjoying your favorite video games on your entire living room wall. Depending on how big you want to go, move the projector further away from the wall and rotate the focus lens to achieve a screen size of 60 inches, 120 inches, 240 inches ... and more! No you're not dreaming - that's hundreds of inches of intense viewing home cinema pleasure! How much would a 200 inch LCD TV cost? Do they even make 200 inch LCD or plasma TVs? Who even needs one when you can buy the CVIS-E31!?! As great as it is for the home, this multimedia LCD projector also shines at the office. Bring it to work and transform boring old talks into captivating presentations. Motivate your staff to get more done or bring it to a potential client site and land the account every time! This big screen wonder is sure to help you dramatically increase sales with next to no effort. Setup is incredibly easy too. Simply connect your laptop to this projector using a VGA cable and whatever shows normally on your notebook now shows on the screen or a clean section of wall in front of you. This projector also supports yellow, red, and white AV cable (also known as RCA or Composite) or red, green, and blue high definition cable (also known as YPbPr or Component) connections with external media players like MP4 players, DVD players, and HDD multimedia enclosures as well as media stored on SD cards or USB keys! That's right - put your favorite movie on an SD card or a USB flash drive, insert it into this projector, and watch it right away if an external multimedia player isn't available. So if you're tired of playing video games or watching your favorite movies and TV shows on an insultingly little TV screen, it's time for some lights, camera, action with this incredible audio video LCD projector for home, office, or school. As always, it's brought to you by the original leader in wholesale direct from China electronics, suppliers of truly inexpensive and innovative products worth blogging about, with a great 12 month warranty and a fantastic customer service team to match - Chinavasion! Big Screen Movies, TV, Games! Connects with: DVD players, MP4 players, video game systems like Sony PS2 and PS3, Microsoft XBOX and XBOX 360, Nintendo Game Cube and Wii, and external HDD enclosures. This projector is for use with 200-240V power supplies. If you're interested in a 100-120V version and will be ordering at least 5 units, please contact our customer service team. Though the projector exterior shows an HDMI input, that function is not available in this model. Connects to external media players, but has it's own built-in AV media player as well. Plays audio, video, and photos! Can you recommend any great movies to watch that would look amazing on this projector? 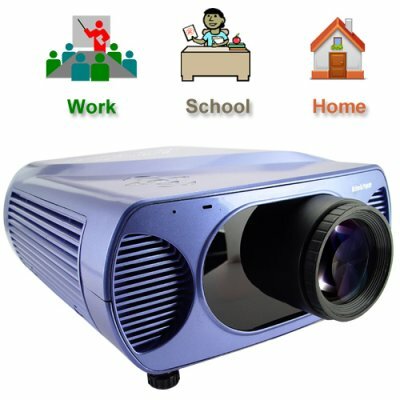 I want to use this projector for presentations, how difficult is it to setup? Setup is so easy even people who can't see the clock on VCR players can do it. VCRs? Do they still make those. For presentations, connect your laptop to this projector using a VGA cable. VGA cables are very inexpensive and are available at any computer store or retail outlet like Walmart. From the projector's remote control, keep pressing the TV/AV button until you arrive at "VGA". Now whatever is on your laptop will be displayed on the screen or wall. That's it! How long does the typical lightbulb last? Usually lightbulbs last for 6,000 hours. Given that your average movie lasts 2 hours, that's roughly 3000 times you can watch the hit chick flick - Titanic.